When I am acting as the “Consult-Ant” and answering questions about ant farms, people are generally interested in finding out more about ant queens. When an ant colony is ready to branch out, the current queen lays eggs that develop into males or new queens instead of workers. Adult male ants are winged, and have small heads and slender bodies. They can easily be mistaken for wasps. 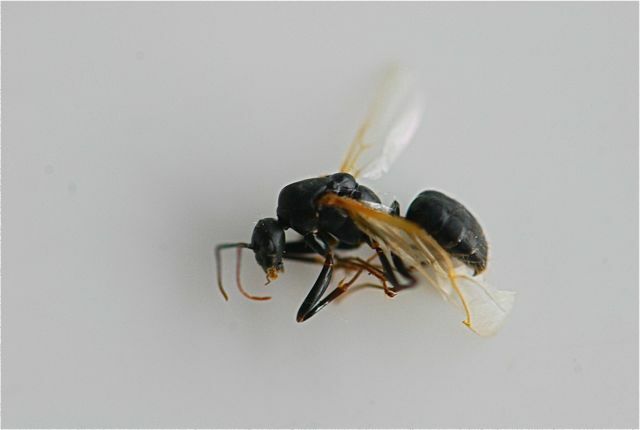 Newly emerged queens are larger than both males and workers, and have four wings. When conditions are just right, such as after a summer thundershower, the males and new queens fly from the nest. The whole colony is in a tizzy when this happens. Worker ants gush from the nest entrance and mill around. Winged males and queens climb up on grass stalks, trees, or anything tall in the area. In many species, the winged queens and males fly to meet with males and queens of the same species of ant from other nests. They enter what is called a mating swarm, a swirling cloud of flying and mating insects. After mating, the males drop to the ground and soon die. The new queens, the ones that escape being eaten that is, also drop to the ground. The queens quickly pull off their wings by rubbing them between the back of their body and their hind legs, twisting and tugging. Once the wings are off, they quickly hide themselves. Ground-nesting ant queens tunnel into the soil while other types of queens may slip into cracks in the bark of logs or creep under nearby rocks. There a queen makes a safe chamber to start her new colony. You can tell she’s a queen because of the scars on her trunk (middle section) where her wings were. 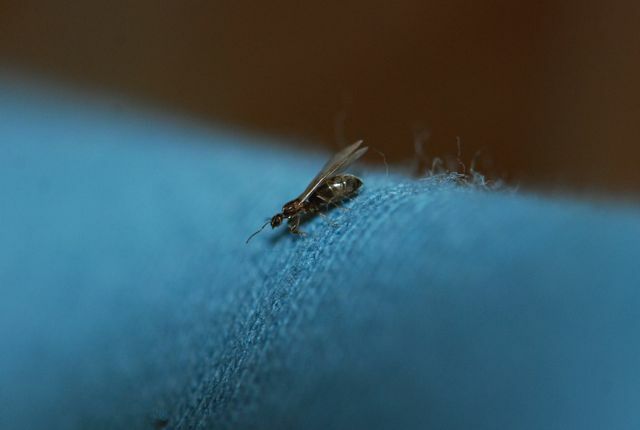 The queen will lay eggs that develop into tiny worker ants, and a new colony is born. Have you ever seen swarming ants? Question: Hi, I am a reading teacher in an elementary school. We are reading a book about ants. My students wanted to know what would happen to an ant colony if their queen died. I was able to find the answers. One of the answers was that the workers would choose a larva or larvae to feed a special diet to enable it (them) to become a queen(s). What does that special diet consist of? Is there any other way for an existing worker to become a queen if the colony’s queen dies? Can she eat a special diet to stimulate hormones that would change her into a queen? First of all, thank you for being willing to look for answers to your students’ questions. I’m sure they appreciate your effort. These are actually difficult questions, and scientists are still finding out some of the answers. The information you found about workers being able to rear a new queen is definitely true for honey bees. The worker honey bees feed the larvae (young grubs) destined to become queens a formula called “royal jelly.” Larvae fed regular food turn into workers. The composition of royal jelly has been studied extensively, and you can buy it over the Internet. Because there are over 12,000 different kinds of ants, however, how an egg becomes a queen varies considerably between species. Ants were long assumed to have the same food-based system as the honey bees, but now that research techniques are more advanced, it seems that at least in some kinds of ants the eggs laid by the queen are predestined to be either workers or queens. No matter how much food it is given, queen egg becomes a queen ant and a worker egg becomes a worker ant. This is found to be the case in harvester ants and big-headed ants (See references below.) When food makes a difference, such as determining whether a worker becomes a big worker (major) or not, it seems to be the amount of food rather than the quality. In ant species with a single queen, generally the workers will not accept a new queen and the colony dies out when the queen dies. In ant species with many queens per colony, however, such as the Argentine ant, the workers may accept new queens. How many queens a colony will accept may be influenced by how highly related the workers are, as well as environmental factors. As for a worker being able to become a queen, once again it depends on what kind of ant you study. In ants with a separate queen “caste,” with a queen that is bigger and structurally different, a worker can never become a queen. Once a worker ant becomes an adult, it can not change its form. 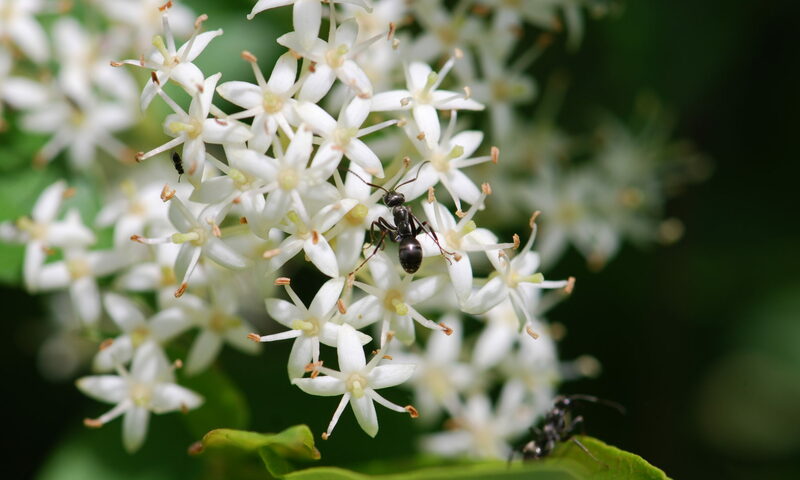 A worker ant does not have wings necessary for going on a mating flight, for example, and can not grow them. 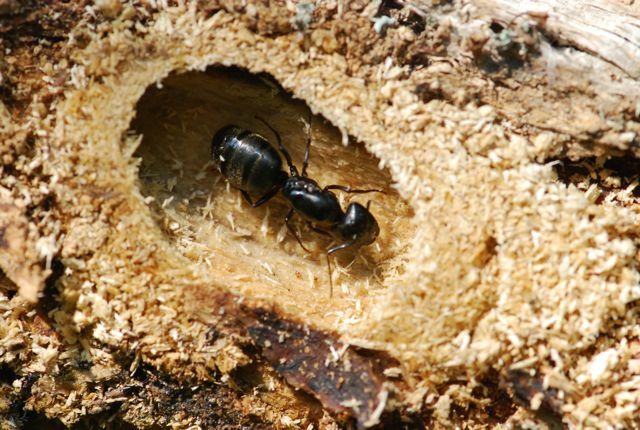 When the queen dies, because the workers are females they may be able to lay eggs, but the eggs are unfertilized and result in male ants. Other ants are more like wasps. All the ants within a single colony look pretty much alike with no physically different queen, and one worker acts as a queen (it has a special name, called a “gamergate”). In this case, when the queen-worker dies, another worker can assume her role. The queen-workers’ hormone levels do change and her sisters can detect the changes. 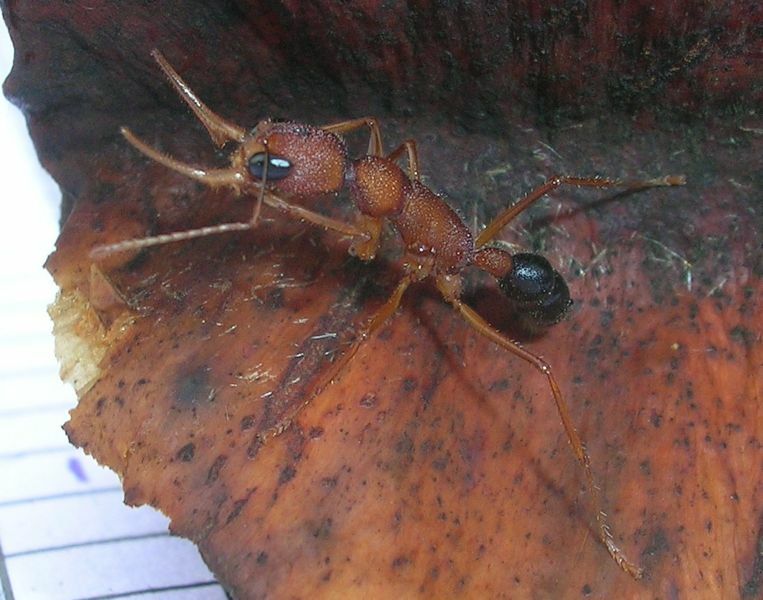 One species with this type of queen-worker is the jumping ant, Harpegnathos saltator. I know that is all probably as clear as mud. 🙂 Please let me know if you still have further questions. You might also be interested in the posts on answers to questions from fourth graders, and the Ant Facts or Fiction quiz. And if anyone has more information pertaining to these questions or knows of more recent research, I would love to learn more. Holldobler, B. and E.O. Wilson. (1990). The ants. Cambridge MA: Belknap Press of Harvard University Press. A recent article in ScienceDaily about harvester ants. Abstract about research on big-headed ants (Pheidole).